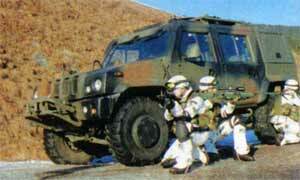 The most recent development in the armoured vehicle range is the Multirole Light Vehicle (MLV). 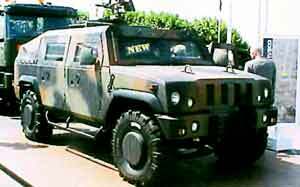 An all new 4x4 tactical scouting vehicle specifically developed for the operational requirements of the twenty first century. This vehicle combines speed and protection with stealth and tactical versatility. MLV is light weight, armoured against small arms, shell fragments and mines and is readily air transportable: key characteristics required in meeting the increasing need for rapid deployment of troops and equipment. Already under consideration by the UK MOD for the Future Command and Liaison Vehicle (FCLV) programme, MLV is the benchmark for a technically advanced armoured reconnaissance vehicle to meet the demands of today’s global defence operations. The chassis of the LMV is of high resistant 'C' shaped reinforced longitudinal members with cross members, front manoeuvre and rear towing plates. 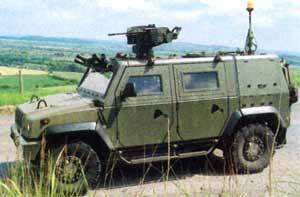 Following experience in the Balkans, it was decided to incorporate a high level of mine protection in the LMV from the outset. It is claimed that the LMV is the first vehicle of its type in the world to have an anti-mine system integrated into the chassis and in addition it has been designed to accept a modular passive armour package developed by IBD of Germany. This can be integrated into the LMV after it has left the factory, as all production LMVs will be "fitted for, but not with" the armour package. 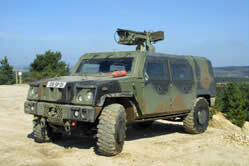 According to IVECO, some customers would take the baseline LMV vehicle complete with the almost flat V-sandwich anti-mine system integrated under the crew compartment while others would also take the appliqué armour package. It was deemed essential that the greatest possible distance should be generated between the seat of the explosion and the cabin crew. Given that the majority of mine blasts are likely to be initiated by wheel pressure, the wheel stations are located well away from the crew cabin. As a result, if the vehicle detonates an anti-tank mine, the explosion will vent upwards, damaging mechanical assemblies but leaving the crew cabin undamaged. To enhance this characteristic, a number of design features have been incorporated. The bonnet is hinged to the chassis and not the cabin, with the remainder of the body designed to be sacrificial, severing from the cabin in the event of a detonation under a rear wheel. While the floor has armour protection incorporated from the start, the crew cabin can be fitted with add-on armour kits. Rather than being standard appliqué armour procured as an upgrade to an in service vehicle, these armour packs were designed for the vehicle from its inception. The basic kit provides ballistic protection against small arms fire, whilst the heavier kit is designed to protect the crew from ambushes, including mine threat. 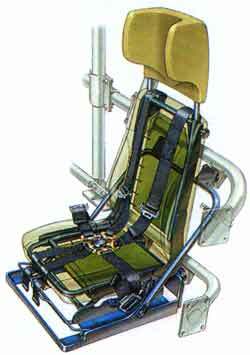 The front two seats are adjustable and three rear seats with foldable back are provided at the rear with an anti-mine headrest. 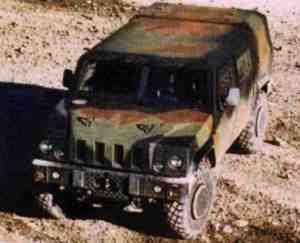 The roof of the vehicle rests on a high resistant roll-bar. The four doors are provided with sliding and dismountable windows. A two-piece windscreen is fitted and this is provided with two-speed wipers and washers. On the roof is a hatch suitable for a central positioned weapon ring, which can mount a variety of weapons up to 12.7 mm in calibre. A cab heater and defrosting system is fitted as standard. An auxiliary heater and air conditioning system is fitted as standard. The light alloy rear body is separated from the crew section in case of a mine explosion under the vehicle rear and contains spare wheel, jerry cans, onboard tools and other equipment. 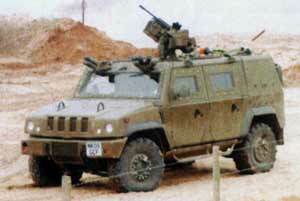 A number of measures have been incorporated to reduce the LMV's thermal, acoustic and visual signature. Silencers and exhaust manifolds have been installed within the 'C' spars that form the vehicle's chassis while the turbocharger has been installed under the engine to achieve maximum thermal shielding. To further reduce the radar signature, both the windscreen and door windows are slanted. The vehicle is powered by an IVECO F1 C 4-cylinder in-line turbocharged diesel engine which develops 190 hp at 3,700 rpm and is coupled to a ZF 6HP 26 automatic transmission with six forward and one reverse gears. As an alternative, a manual transmission with five forward gears and one reverse can also be fitted. A full time transfer box is flanged to the rear differential to minimise the weight suspended under the crew compartment. This is claimed to significantly reduce the risk to the crew from underbelly mine explosion. There is an in-built longitudinal differential that is electropneumatically lockable with low, high and neutral ratios. 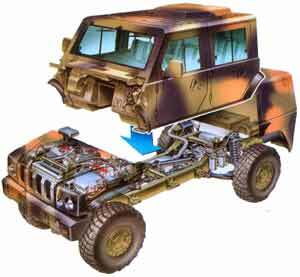 Suspension is of the independent double A-arm type, utilising helical springs with coaxial shock-absorbers. 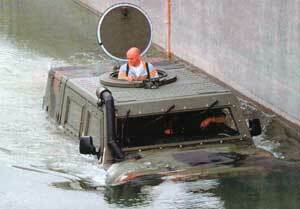 The vehicle can ford to a depth of 1.5 m with preparation. Optional equipment includes a central tyre pressure-regulation system. This allows the driver to adjust the tyre pressure to suit the terrain being crossed. Power steering is standard as is an auxiliary heater, air conditioning system, electrically heated windscreen and a front-mounted winch. Both left- and right- hand models are available. 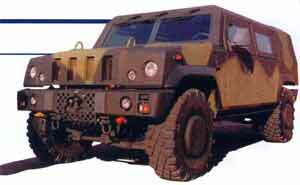 The LMV is built on a highly adaptable chassis, which allows it to form the basis of a family of vehicles that are capable of filling numerous roles. Following a competition the LMV was selected to meet the UK's requirement for a Future Command and Liaison Vehicle (FCLV). Alvis Vickers is now BAE Systems Land Systems and the vehicle has now been named Panther. 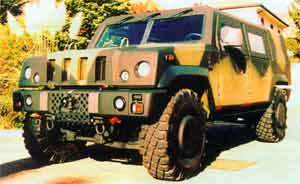 The company is scheduled to deliver the first production batch of Panther vehicles in January 2007. 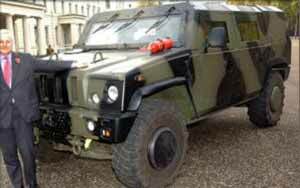 In mid-2005 BAE Systems Land Systems Newcastle-upon-Tyne facility completed the seven pre-series Panther (4 × 4) Command and Liaison Vehicle (CLV) vehicles. 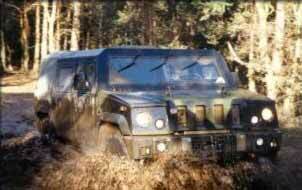 These were put through an intensive trials programme at the Armoured Trials and Development Unit (ATDU) at Bovington, Dorset, and the Motor Industry Research Agency (MIRA) facility. Integration of production Panther vehicles started in mid-2006 with a total of 50 vehicles due to be completed by January 2007 in order to meet the British Army's required In Service Date (ISD). The latter requires BAE Systems to supply a batch of 50 vehicles for one brigade in 3 Division fully supported and with trained personnel in position. 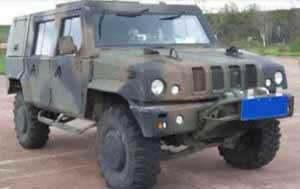 Iveco Defence Vehicles Division supply the baseline LMV who fit UK source sub-systems and deliver the complete vehicle to the customer. 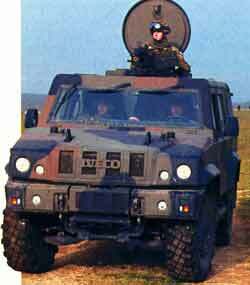 Of the 401 vehicles, 326 are Group 2 which are fitted with the Selex Enforcer 7.62 mm self-defence weapon (SDW) and surveillance target acquisition (STA) with the remaining 75 fitted for but not with the SDW/STA. Production will average 13 vehicles a month with final deliveries in 2009. 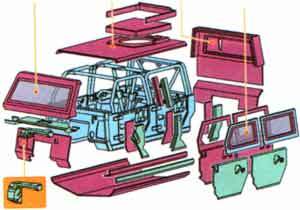 All production vehicles Panther have an integrated floor protection system with the crew compartment provided with a modular armour package. 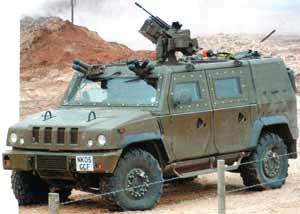 BAE Systems Land Systems will install the Selex Enforcer SDW/STA armed with a 7.62 mm machine gun (MG), rear pod, roof, two banks of four electrically operated smoke grenade launchers, HUMS, fire detection and suppression system and driver vision enhancer. 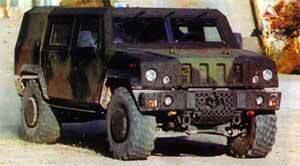 The Bowman digital communications system and 7.62 mm MG are government furnished equipment. There will be some 15 roles for Panther of which at least three are expected to tow a trailer with additional equipment. 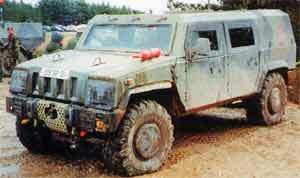 While most will be used by the British Army some will be used by the Royal Air Force Regiment. The amount of equipment that has to be stowed under armour takes up valuable internal volume and in addition to the un-armoured rear pod and some roof stowage will also be fitted. 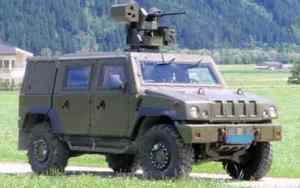 For the potential requirements of the German Army, the German company Rheinmetall Landsysteme has a licence to market the vehicle under the name of the Caracal.